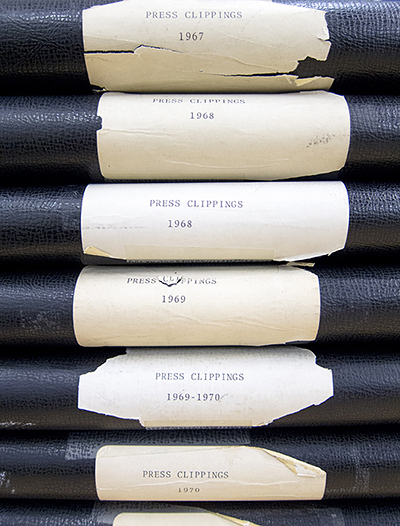 Press clippings binders in the MCA Library & Archives. The tone and reputation of an art museum is hinged on its leadership. Even though I have attended exhibitions at the MCA since its inception in 1967, before I began this project I never seriously considered its behind-the-scenes structure - as an early museum goer and later as an artist, my focus was always within the museum's galleries. My dear friend Greg Cameron, who served as the MCA's deputy director and chief development officer under Robert Fitzpatrick, was instrumental in introducing me to the inside of this institution and he demystified the complex process of transitioning from a smaller museum into a world class venue at an enviable location. Kevin Consey and Allen Turner, respectively the MCA's director and president of the board during the museum's transition to its current location, revealed the inner workings of a sometimes difficult growing period. When my father turned 40 in 1966, my mother's gift to him was sculpting lessons at Chicago's Contemporary Art Workshop, and from 1966 until 1972, he worked with the lost wax process, casting bronze busts. While studying with Jack Kearney and Cosmo Campoli at the Workshop, he brought our family to what now turns out to be some of Chicago's earliest contemporary art events. I vividly recall Campoli's 1971 exhibition at the MCA on Ontario Street. While researching the MCA for this project changed the way I think of the museum, the process has rekindled my earliest memories of how art can surprise, confuse, and enlighten.